Common Mistakes That Project Manager Need To Avoid. Even a Senior Project Manager Can Learn From – CYA! 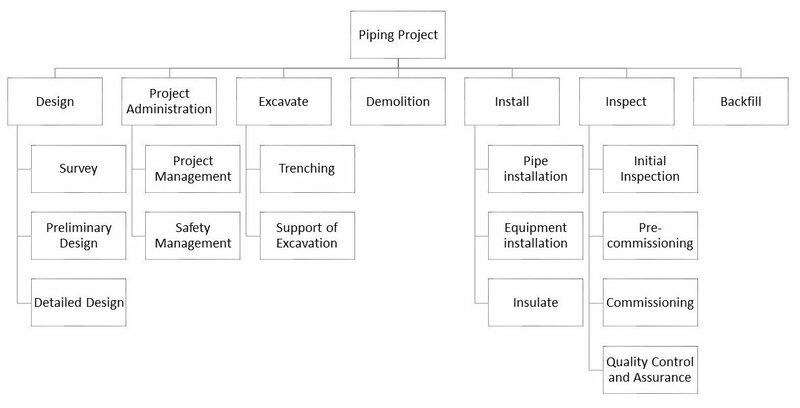 A Work Breakdown Structure (WBS) provides a hierarchical or a breakdown structure that decomposes the project scope into more discrete and manageable work components. The process of breaking down the scope into a WBS should continue until the entire project scope is decomposed in adequate details matching the level of control that the project team wants to exercise. WBS breaks down the entire project scope into meaningful components. WBS is a key project artifact that provides a basis for project planning, performance measurement, and project control. It also creates common language among the project team members and stakeholders to ensure everyone is using the same terms in referring to specific parts of the project scope. Contrary to the popular belief that only one WBS should be developed for each project, it is suggested that two WBSs be produced to define a project scope: a deliverable-oriented WBS and a process-oriented WBS. [2,3] These two work breakdown structures are different but they are not produced independently of each other. Developing and using these two key types of WBS has certain benefits that justify the efforts to produce these two artifacts and use them in tandem. A deliverable-oriented WBS (also known as product-oriented WBS) decomposes the project scope into smaller and more manageable deliverables. Deliverable are tangible components that need to be delivered to complete the project. They are typically a physical component or an item that needs to be produced, obtained, or supplied as a result of executing project activities. These deliverables are either interim or ultimate deliverables that are delivered to satisfy project requirements. In construction projects, preliminary plans and specifications, bid documents, and pre-construction mockups are example interim project deliverables. Example of ultimate project deliverables in a construction project may include concrete structures, structural steels, building facade, and a building’s mechanical system. WBS elements in a deliverable-oriented WBS are typically in the form of a noun because WBS elements identify tangible components that are typically a physical item that needs to be produced, obtained, or supplied. A verity of breakdown criteria can be used to develop a deliverable-oriented WBS to meet the specific needs of projects. For example, a construction contractor may breakdown its scope of work based primarily on physical locations of different project components; whereas, a mechanical contractor may use a system-wide approach to identify systems, subsystems, and lower level components in each subsystem to decomposes its scope of work. The following figure provides an example deliverable-oriented WBS for a residential project. A process-oriented WBS, on the other hand, defines the project scope of work in terms of process steps (i.e., work phases, or functions). A process-oriented WBS defines what process steps need to be taken to deliver each of the project deliverables. WBS elements in a process-oriented WBS are typically in the form of a verb. They may also identify different work disciplines that are involved to work on various project deliverables. Example WBS elements in a process-oriented WBS include engineering, detailed design, procure, install, and construct. These WBS elements are provided in a hierarchical structure to breakdown the project scope into different functions or process steps. For example, a WBS element such as install may need to be broken down into mechanical and electrical installation depending on a particular project’s scope of work and the scope of responsibilities of the party that is developing the WBS. The following figure provides an example process-oriented WBS for a piping project. work processes are identified in an appropriate fashion to ensure project team members have the same understanding of what needs to be done from a work process or functional perspective to deliver each project deliverable. Developing both deliverable-oriented and a process-oriented WBS also helps project teams better identify project activities.
. Golpayegani, S. A. H., & Emamizadeh, B. (2007). Designing work breakdown structures using modular neural networks. Decision Support Systems, 44(1), 202-222. Common Mistakes Project Managers Need To Avoid. Even Senior Managers Can Learn From. CYA! CYA - Cover Your Gluteus. Your gluteus maximum, gluteus medius and gluteus minimus. Project Managers keep the world moving. It might be a bold statement or even a grandiose view. However, it is not necessarily false. We all evaluate our current situations, prioritize, make decisions and adjust as we go through our day. All to make the project a success. Now let's get our ego back down to earth and be a little more humble and real. Just like on earth there are moving forces like changing weather patterns, tectonic plate shifts, and volcanic eruptions. There are also forces in the business that are moving. Sometimes those forces don't move the way we want them to. Some of the forces are so strong that they might run you over. To mitigate natural disasters there are insurance policies that one can take. At work CYA is that insurance policy. Not all forces are created equal. A complement to your boss about you is a good thing. A complaint to your boss about you is not a good thing. Documentation is your CYA. It's not just an insurance policy. It is part of your job. Document the decisions that were made. Document the pros and the cons of those decisions. Document the outcomes of those decisions. Then when the time comes – unfortunately, it will come at some point of your career – you can present your CYA insurance policy to your boss or your sponsor. Most negative forces that will come in business is when a stakeholder doesn't get their way on a project and does something that will put his or her perspective in a better light. And, put your management of the situation in a negative light. There is a saying that "The more [crap] that is thrown against the wall. The more it will stick." Do your due diligence as a Project Manager in documenting the decisions that have taken place. Not just for the business’ sake. But for yourself as well. You can't help the business if you are no longer there because someone decided to prioritize their agenda at your expense. From the Game Theory in Management, Michael Hatfield provides three alternatives to the enhanced systems that are available today for Critical Path Methodology and Earned Value Methodology. (Estimate at Completions, Duration at Completion, Cost at Completion) Read the article.